As the immortal My Chemical Romance once sang: “I gave you blood, blood, gallons of the stuff” which sounds like a fairly accurate representation of the Assassin’s Creed series since the first smash hit game set people’s bloodlust burning. The murderous ease with which you could dispatch nearly everyone instantly caught gamers’ imaginations, and from there the series has gone from strength to strength. On the one hand, the sheer savage joy of killing people with a vast variety of weapons and the greatest of ease is still both absorbing and highly enjoyable. On the other, over the last few years, as we’ve travelled on Ezio Auditore da Firenze’s journey, we’ve slowly become over-saturated with the series. Assassin’s Creed 3 will change that. Make no bones about it, the game has changed with the passing of the baton from Ezio to Connor and his unpronounceable surname, and it has changed for the better. One of the greatest parts of the Assassin’s Creed series is the places that it thrusts you into, and one of the intentions from its inception was to take the player to settings and worlds that had seldom been seen in games before – a goal that they accomplished with aplomb. The worlds that gamers experienced was part of the series’ charm, and witnessing historical events, such as the Crusades, and exploring places like Renaissance Italy took players’ breath away. The next game in the series is set in another significant but underused period in history – the American civil war. Connor, the protagonist, is torn between the two sides of the war, and though we’ve pretty much only seen him side with the United States thus far, there are promises that members of both factions are fair game. But all of this is old news. 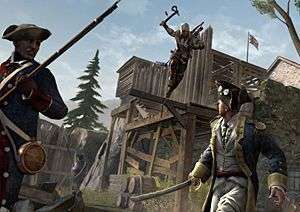 What isn’t old news is the demo that we were shown at Gamescom recently, which provided us with an example of just how impressively Assassin’s Creed III is shaping up. In keeping with the theme of historically important moments, we were thrust into the battle of Chesapeake during the demo, with Connor at the helm of his personal ship. For this battle we were told that he had sided with the United States, trying to stop in incoming flotilla of reinforcements for the opposition. Now for those of you who aren’t American history buffs, the battle of Chesapeake was a naval battle, meaning that we got to have a look at how fighting on the seas would be conducted. Although it looked like it would take a little while to get the hang of, the system was not at all complex. Firing cannons is obviously your main method of attack on the ships, and you will be able to do so with various different types of ammunition, to boot. In addition to your standard cannonballs, you will also be able to use grapeshot – technically when the crew loads the cannon with debris, but in this case a bunch of tiny cannonballs – which shred the smaller enemy ships with ease, along with a pair of chained cannonballs, which destroy masts, and a flaming cannonball that, oddly enough, sets ships on fire. What makes the naval combat in really interesting is the engine that Ubisoft have utilised for the game. According to them the wave and ocean simulation is like nothing ever seen before in the games industry. This will affect the game, as was proved to us in the demo, as it shifts the sailing conditions that have to be taken into account when engaging with other ships. This should add an extra element of realism, as it will mean that you will have to choose the timing of your shot to coincide with your ship reaching the crest of the wave. With two naval missions to play through in the story and entirely separate set of side missions that culminate in an incredible battle with an enormous enemy vessel, there will be plenty of time to get into the hang of steering the ships and engaging the enemy. When your feet do meet solid ground (or solid enemy ship, as the case may be) the game shows off just how savagely skilled Connor is. 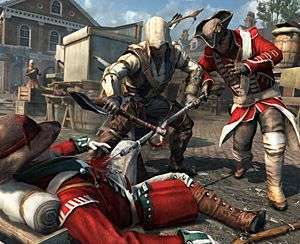 Fluid, speedy and smooth, the combat in Assassin’s Creed III is a class above the already sophisticated combat that we saw in Assassin’s Creed: Revelations. We saw Connor clamber aboard an enemy ship and take it down, crew member by crew member. In the midst of this we got a good look at some of the weapons at Connor’s disposal. He showed off some quick use of his versatile new hidden blade before switching to the signature weapon of this installation – the tomahawk. Faster and a lot more savage than Ezio’s sword, I almost want to say that using the tomahawk is a visceral thrill. I’ll restrain myself however, and simply explain that it’s great fun to bury your weapon in someone’s skull and then having the capability to take out the next person almost instantly. On top of that, there is also the ability to wield your pistol along with your tomahawk, making wanton killing of everything that moves even easier. Although we’ve heard little about the storyline of the game, I can confirm that’s a real pleasure to move on from Ezio to a new hero. 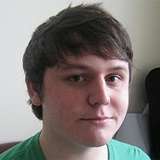 Connor has yet to prove himself the character that Ezio was, but the early signs look promising. We were also assured that there would be large portions of the game where the focus of the story would be Desmond, who apparently has yet more story to tell. 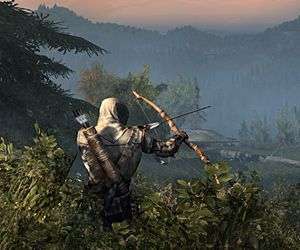 Assassin’s Creed 3 is meant to be the crescendo of a trilogy however, so we can expect this to be the triumphant end of Desmond’s tale. The question is whether this will be the only installment of Connor’s story, or whether we will once again have multiple installments of the same game once again. I can’t help but hope not, because Assassin’s Creed deserves a triumphant ending, not the drawn out whimper that Ezio was subjected to. We’ll find out whether Connor is a worthy heir for Ezio when the game is released on the 30th of October this year. Whether he is or not though, the game itself has set itself up as one worth playing, and has put itself in prime position to deliver a triumphant conclusion to what has become one of the iconic series of this generation.